A little twitter chat on Monday night with Eloise and Claire sparked loads of faded memories of bands I loved, college friends and my time at university. I never really had a live journal or blog before this but if I did all my teenage ramblings would have been about bands not dresses. I'm not as eloquent as other bloggers so I'm just going to share some photos of what the college and university years of my life (2003-8) meant to me. 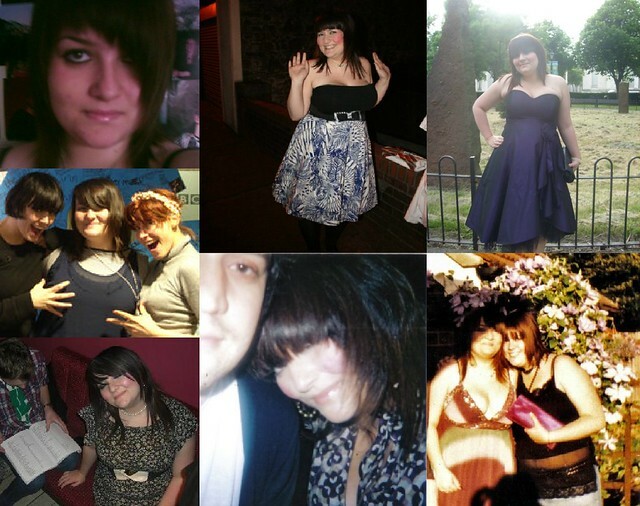 Here are some of the tragic photos of me from my teenage years, try not to laugh too much. It was all about the big fringe, I think I thought I was a mix of Karen O an Kate Jackson. The tweets that ended with me emptying all my crates of records and CDs on the floor and digging out all my old mix tapes. I don't think my generation ever had its defining moment or movement. My older cousins had Brit Pop and my mum grew up with Motown and miners strikes. I clung on to all those post-punk bands in the early to mid 00s like The Strokes, The White Stripes, Maximo Park and Interpol. I thought Franz Ferdinand's Take Me Out was the best song I had ever heard and went on my first trip without my parents to London to see them play three nights in a row at Brixton. I read The Master and Margarita because bands referenced it and poured over the NME every week and stuck cuttings of my idols all over my bedroom wall. I worked behind the bar in a rugby club and spent all my wages on CDs and gig tickets, I wish I had that disposable income now. "Unfortunately nothing else ever in your life will affect you like music did in your early teens, and it puts you on a certain course. It’s like a love affair. It widens your taste and it broadens your view on everything"
Seriously though, I have so much love for the 2005ish indie scene. Went to so many gigs in Cardiff as a student, think that's where my whole student overdraft went. So worth it though! haha I met Russell at my summer ball in uni where he did a DJ set. Think I scared him, was a tad over enthusiastic... Used to swoon over him and his swooshy hair. I completely agree with that Morrissey quote, I don't seek out or get obsessed with new bands anymore but the ones I loved when I was a teenager I STILL love! I was a bit of a retro teenager and fell in love with bands before my time, like The Cure, The Smiths, The Manics, Suede, etc. 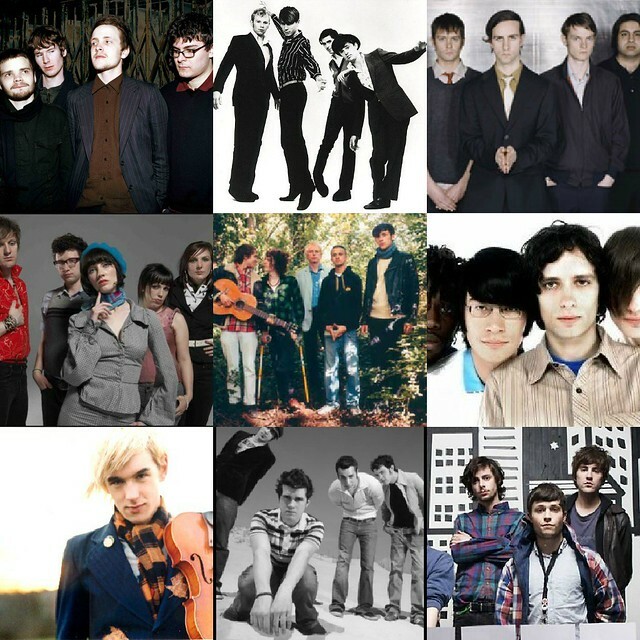 I also loved Patrick Wolf and lots of American stuff like The Decemberists, Sufjan Stevens, Arcade Fire, Polyphonic Spree. I'm going to go and reminisce now! soooooooo much ♥ for The Manics ( I'm from Blackwood so I have too) and Suede. This is awesome, fab idea for a personal post :) I agree about franz ferdinand, saw them 2 years ago at ATP at Butlins, brought back some very happy memories. Hx Ps, it's still all about the big fringe for me..
Wahh just looked at your listener takeover link. Pretty much identical to what mine would have been.. I lol'd at the part about South Wales' 'unfortunate' scene, I still love a bit of Brand New and Taking Back Sunday! Can't deny the joys of those 'emo' days haha! Thank you for this, I was obsessed with Franz Ferdinand too!